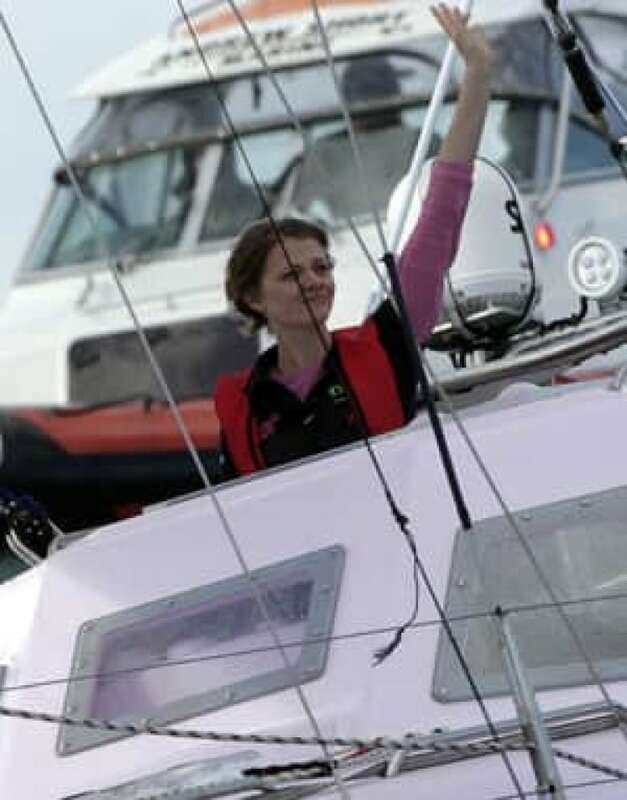 After seven months at sea, an Australian teen crossed the finish line of a round-the-world journey Saturday in her pink yacht, becoming the youngest person to circle the globe solo, nonstop and unassisted. After seven months at sea, an Australian teen crossed the finish line of a round-the-world journey Saturday in her pink yacht, becoming the youngest sailor to circle the globe solo, nonstop and unassisted. Thousands of spectators erupted into cheers as 16-year-old Jessica Watson sailed into Sydney Harbour, the finale to an epic adventure in which she battled 12-metre waves, homesickness and critics who said she'd never make it home alive. "She said she'd sail around the world, and she has," a tearful Julie Watson said as she watched her grinning daughter cruise past the finish line from a nearby boat. "She's home." Watson gasped, laughed and waved her arms frantically as she caught sight of her parents when they pulled alongside her 10-metre yacht, Ella's Pink Lady. The teen was set to touch land for the first time in 210 days by docking at the city's iconic Opera House, where she was to be greeted by throngs of fans, the Prime Minister and her family. "I'm completely overwhelmed," Watson said, her voice trembling, in an interview broadcast live on a screen outside the Opera House. "I just don't know what to think and what to say at the moment. It's all a bit much but absolutely amazing." Watson, from Buderim, north of Brisbane in Queensland state, sailed out of Sydney on Oct. 18, despite fierce criticism of her parents, whose decision to let their daughter attempt such a feat was seen by some as an act of insanity. Through it all, they stood by their opinion that she was well-prepared, and noted that she has been sailing since she was eight. "I don't think any of us would ever doubt Jessica Watson again," said New South Wales state Premier Kristina Keneally, who was waiting at the Opera House to welcome the teen. Watson travelled northeast through the South Pacific and across the equator, south to Cape Horn at the tip of South America, across the Atlantic Ocean to South Africa, through the Indian Ocean and around southern Australia. Australian Jesse Martin currently holds the record for the youngest person to sail around the world solo, nonstop and unassisted, after he completed the journey in 1999 at the age of 18. Watson's feat will not be considered an official world record, because the World Speed Sailing Record Council discontinued its "youngest" category. Watson's managers have dismissed those claims and argued she doesn't need to adhere to the council's rules anyway, since they won't be recognizing her voyage. But her journey was also peppered with moments of beauty. On her blog, she described stunning sunrises over glassy seas, the excitement of spotting a blue whale and the dazzling, eerie sight of a shooting star racing across the night sky above her boat. She also had fun, chatting about boys and fashion with "Silly," a little brown seabird that landed on her yacht and hung around for awhile. She sang at the top of her lungs with no audience to critique her and indulged her sweet tooth with chocolate cupcakes she baked in her tiny kitchen. A video she shot shows her giggling while dumping a ceremonial bucket of saltwater over her head after crossing the equator.